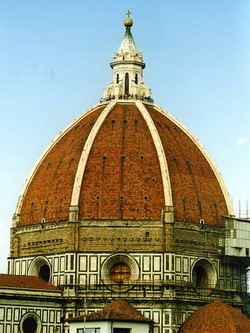 Brunelleschi’s dome is the largest masonry dome ever built and it is the coverage of the Cathedral of Florence, Italy. Brunelleschi's dome, 45 meters wide, was originally a wooden dome built by Arnolfo di Cambio. To construct a dome over the presbytery mixed up many technical problems. Imagine the thriving city of Florence in the year 1296. Proud of their city, the Florentines began to build a glorious cathedral, designing it with space for a huge dome. But there was a problem: no one knew how to erect such a dome. They made a model which they kept in the half-built cathedral to show how the dome ought to be. If built, it would be the highest and widest vault raised - but how to make it remained a puzzle. The people of Florence had a touching faith that some day God would send a man who could solve the puzzle. Their faith was rewarded by a goldsmith and clockmaker called Filippo Brunelleschi who was born in 1377. The dome Brunelleschi designed and built still dominates Florence today, a miracle of design and engineering. Whether your stay in Florence is only a brief stop in the Piazzale Michelangelo to see the bronze copy of David and look across the river at the city, or whether you stay for years, the abiding memory will be the way the rhythm of the tiled rooftops culminates triumphantly in the great dome. The cathedral is seldom known by its name, Santa Maria del Fiore, but simply as the Duomo (the Dome) for locals or Brunelleschi's Dome worldwide. The difficulties faced by Brunelleschi in constructing the dome were enormous. The usual way to build an arch or dome was to support it with scaffolding called "centring" but the open space in the cathedral was 42m in width and the Florentines wanted a tall, soaring dome. All the timber in Tuscany would not have been sufficient to make the centring. Brunelleschi decided to build without scaffolding in such a way it supported itself as it progressed. Brunelleschi's solutions for the dome were ingenious, innovative and costly. But even today Brunelleschi's Dome is the tallest building in Florence, over 600 years after it was built. Brunelleschi's invention went everywhere. King tells how he set up a caffe high on the buildings so the workers would not have to return to the floor for lunch. Once up, the dome was recognized as a marvel of the age "vast enough to cover the entire Tuscan population with its shadow," as a younger contemporary of Brunelleschi's, Leon Battista Alberti noted. or find out more about Brunelleschi's Dome history.